"An incisive look at French influence in Central Africa." Lt-Col Robert Brown, Soldier of Fortune magazine France in Centrafrique explores the pre- and post-colonial history of the Republic of Central Africa as well as giving the reader a taste of the country's involvement in World War II itself. France in Centrafrique explores the pre- and post-colonial history of the Republic of Central Africa as well as giving the reader a taste of the country's involvement in World War II itself. The main focus of this volume is on Central Africa's independence and the rise to power of Jean Bedel Bokassa including the Focard network and Françafrique connections, France's military links with RCA (defense agreements), the republic's post independence military, its politics and Bokassa's coup. It takes a staggering look at Central Africa under Bokassa's leadership and the ensuing break down in its relationship with France. Operation Baracuda was the natural culmination of that soured relationship and in this book Erwan de Cherisey examines"France's last colonial expedition", the planning of the operation, its players, a step-by-step breakdown and its outcome. To bring the reader up to speed with the RCA de Cherisey discusses the years after Bokassa, a new political rule, the effects on the army and the relationship with France all the way to Operation Almandin I, II and III. France's involvement in the RCA is deep-seated and ongoing. 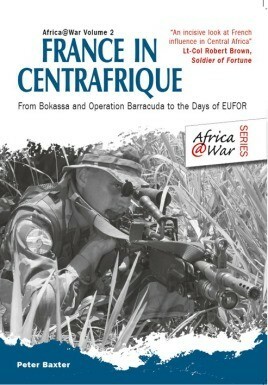 This book concludes with a look at Operation Boali, Bozizé's coup and the international fall-out in terms of further intervention both from France and the EUFOR. Peter Baxter is an author, amateur historian and African field, mountain and heritage travel guide. Born in Kenya, Peter has lived and travelled over much of southern and central Africa and has guided in all the major mountain ranges south of the equator. Peter lives in the United States, working on the marketing of African heritage travel as well as a variety of book projects. He is married with three children.